Can Treloar Win Championship Number 7 On Sunday Night? Treloar already holds the record for the most number of wins with six, one more than the retired Dennis Nash and Glenn O’Brien, and four more than the next best rider still riding, Mark Drew. And he’s been in good form this season with wins in the New South Wales and Queensland Championships, and a new track record at Gillman. Gillman has been far-and-away the leading track for Sidecar racing in recent years but that hasn’t translated into national championship wins. It is actually an incredible 40 years since a South Australia rider last won at home – Neil Munro at Rowley Park in 1973 – and just as incredible only two riders have won away from home in that time, 22-year-old Riverland rider Ken I’Anson who scored an upset win over Dennis Nash at Claremont in 1977, and Mark Mitchell with an equally unexpected win over Darrin Treloar at Mildura in 2009. Interesting though, the only other two South Australians (in addition to Mitchell) to stand on the podium in the last five years are the two seeded riders for Sunday night, Mick Headland (second in 2008) and Mark Plaisted (third in 2011). And both have also been the only double winners of major events at Gillman this season – Headland winning the Blackchrome Spectacular and the Masters, and Plaisted winning the SA Championship and a Grand Slam round. The other major event winners were Jason Hardy (Gillman Championship) and Darrin Treloar (the other Grand Slam round). To compete in an Australian Speedway Sidecar Championship all riders and passengers must first submit a nomination form to Motorcycling Australia, the controlling body of motorcycle sport in Australia. Once the nominations have been received the Speedway Commissioners of Motorcycling Australia then determine if a Qualification meeting will be held, and if so, how many, and who, will be seeded to the Championship meeting. This year eight riders have been seeded to the Championship meeting and they were effectively the first and second placed home state riders in the Queensland, New South Wales, Victorian and South Australian Championships. The seeded riders originally were Darrin Treloar/Simon Cohrs and Grant Bond/Glenn Cox (NSW), Warren Monson/Matt Morgan and Jason Bradshaw/Steve Behsmann (Vic), Scott Christopher/Tyler Moon and Brodie Cohen/Josh Sinnott (Qld) and Mick Headland/Paul Waters and Mark Plaisted/Sam Gilbert (SA), but Christopher withdrew last week (because of bike problems) and was replaced by Dylan Blain/Robert Gottardi. The two NSW riders, Treloar and Bond have a massive 39 Australian Championship appearances between them and while, unlike Treloar, Bond hasn’t won the championship he has an impressive record with 18 appearances and 9 top six finishes. Remarkably his best finish was his most recent when he finished second to Treloar in the 2012 championship. The next day they paired together to win the Australian Teams Championship. Warren Monson has been another successful rider this season and leads the Ikon Suspension Grand Slam Series points with one round remaining. The other three seeded riders, Brodie Cohen, Dylan Blain and Jason Bradshaw might have the same problem as some of the riders in Saturday night’s qualifying meeting, a lack of track time, although it doesn’t appear to have hampered 19 year old Queenslander Blain, who reached two State championship finals this season, the only rider apart from Treloar (who reached three) to do so. New South Wales (Tamworth, 16 February) Treloar/Cohrs, Blain/Gottardi, Malcolm German/Stephen Stagg, G. Bond/G. Cox. Spectators have the chance to see the Championship riders in action free of charge tonight (Thursday) when most will take part in a practice session at Gillman between 6pm and 9pm. The food canteens will not be opened but drinks will be available. Entry will only be through the Eastern (back) gate at the rear of the pits. Full details of the championship meetings are on the Gillman website under the news story “Gillman Speedway K Trans Australian Sidecar Championship Details” posted on Monday, 18 March. 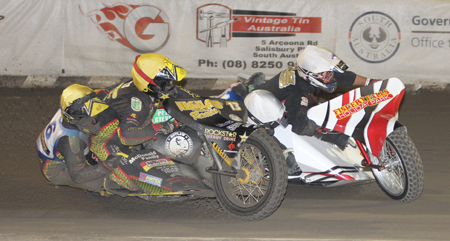 South Australia’s two seeded riders in action at the last Gillman Speedway meeting on 16 March, Mark Plaisted-Sam Gilbert (red) and Mick Headland-Paul Waters (white). Photo by Judy Mackay. 24 riders will take to the track at Gillman Speedway this weekend in two nights of world class speedway action to decide the 2013 Australian Sidecar Champion. There has been one big event after another at Gillman this season, starting with the Blackchrome Sidecar Spectacular back on 10 November, followed by the Gillman Track Championship, South Australian Championship, Gillman Masters and the Ikon Suspension Grand Slam rounds. All were prestigious events, with plenty of kudos for the winners, but nothing compares to the Australian Championship. This is the toughest event in World Speedway Sidecar racing and on Saturday night (30 March), sixteen of those riders will take part in the K Trans Qualifying Meeting to determine eight riders to go forward to the Championship decider on Sunday night (31 March). It sounds relatively easy to score enough points from five rides to finish in the top eight, but tell that to the eight riders who miss out! And make no mistake, some good riders are going to miss out because these riders are all amongst the best in Australia or they wouldn’t be there. They won’t necessarily have a bike problem, or even do anything wrong. They might ride their hearts out and have us thinking they deserved to get through, but the simple fact is only eight can make it. For those that do make the cut, it all starts from scratch again Sunday night, but as recently as 2010 both first and second places in the final went to riders who had come through the qualifying meeting – Jason Aldridge and Rick Howse – so Saturday night’s riders will all know it is possible to come through the qualifying meeting and win the whole shebang. So who are the favourites to get through? Well there are three former Australian Champions in the line-up – Mark Mitchell, Mark Drew and Russell Mitchell – and barring mishaps, they will be expected to get through. Then there are three riders who have been in top form all season, often challenging and beating the very best riders, and they are Wes Jenkins, Jason Hardy and Trent Headland. Again, barring mishaps, they would be expected to qualify. Jenkins, in particular, is a rider who could be a serious threat in the title, but conversely he’s had mechanical issues during his appearances at Gillman this season and he’s going to need a trouble free run if he is to win the title – or even to qualify. That’s six most Gillman regulars will have pencilled in but after that it gets much harder, in fact too hard, to predict who the other two will be. James Hinton and Malcolm German are always around the mark in any event they contest, but they may suffer from a lack of track time this season, which could sway things towards Damien Niesche, Rick Stephens, Byren Gates or Clint Mayes, although Mayes may also suffer from a lack of much racing. Niesche and Stephens have been in career best form so both would be worthy qualifiers, while Gates is capable of anything. He could come out and win the meeting, but could just as well miss the cut! The two New South Wales teenagers, Hayden Bond and Shane Hudson, could also be in the mix at the end of the night, but once again lack of track time might be a problem, with few meetings held in New South Wales this season, but Mildura’s Neale Hancock and Alice Springs’ Chris Dess might struggle to qualify against this level of opposition. The new race jackets, manufactured by Blackchrome, which the riders will wear this weekend. Motorcycling Australia has announced some changes to the line-ups for the K Trans Australian Sidecar Championship meetings to be held at Gillman Speedway in Adelaide on 30 & 31 March. One of the seeded riders, Scott Christopher, has withdrawn because of problems getting his bike running well enough to challenge for the championship, and he has been replaced by Dylan Blain. Blain got the nod by selectors by virtue of his results in the Queensland and New South Wales Championships. In Queensland he was the third highest point scorer (behind Darrin Treloar and Brodie Cohen), but failed to finish in the final which was won by Treloar ahead of Cohen and Christopher. With Christopher’s withdrawal that makes Blain the next best placed home rider in the Championship, but to further enhance his credentials for a seeded berth he finished second to Treloar in the New South Wales Championship. Blain’s place in the qualifying meeting has been taken by second reserve Damien Niesche. The first reserve, Clinton Mayes, had earlier gone into the meeting as a replacement for Justin Plaisted, who is under a riding suspension until late April. Plaisted appealed against the length of the suspension, and was selected for the qualifying meeting subject to winning his appeal, but the appeal was heard on Tuesday night and he was not successful. 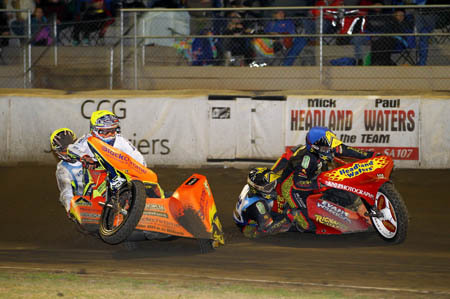 Adelaide’s Gillman Speedway stadium is the venue for the 2013 K Trans Australian Speedway Sidecar Championship on the Easter weekend. The Championship will be staged over two nights, with a qualifying meeting on the Saturday night (30 March) and the Championship Final on the Sunday night (31 March). 24 of Australia’s best riders will take part with 8 seeded into the Sunday night meeting, and the other 16 – including three former Australian Champions, Mark Drew, Mark Mitchell and Russell Mitchell – to contest the qualifying meeting with the highest 8 point scorers progressing to the Sunday night. There will be more details of the riders on the Gillman Speedway website over the next week or so. Meeting Dates: Saturday night, 30 March 2013 and Sunday night, 31 March 2013. Gates open: at 2 pm on Saturday, 30 March & 4 pm on Sunday, 31 March. Racing starts: at 7.30 pm. Format: 16 riders x 20 heats. Highest eight point scorers qualify for the Championship meeting the next night. 8 heats, a semi-final and a final to be held on the infield junior track while the main track is watered between rounds of the qualifying meeting. Riders/Passengers (alphabetical order): Tom Adams / Katelyn Silvy (SA), Jackson Barbary / Josh Malic (Vic), Jackson Bond / Liam Cox (NSW), Talysha Dawson / Chealah Dawson (Vic), Bayley Ogilvie / Hannah Ogilvie (Qld), Jack Sylvia / Harry Hearne (Vic). Riders/Passengers (alphabetical order): Dylan Blain / Robert Gottardi (Qld), Grant Bond / Glenn Cox (NSW), Jason Bradshaw / Steve Behsmann (Vic), Brodie Cohen / Josh Sinnott (Qld), Mick Headland / Paul Waters (SA), Warren Monson / Matt Morgan (Vic), Mark Plaisted / Sam Gilbert (SA), Darrin Treloar / Simon Cohrs (NSW) plus highest eight point scorers from Friday night. Format: 16 riders x 20 heats plus a last chance semi-final and a final. The 4th to 7th highest scorers go into the semi-final; and the winner of the semi-final and the highest three scorers from the 20 heats go into the final. K Trans WA, Australia wide transport services, specialises in the Transportation of Pipes, Transportable Accommodation Units & Concrete Products. Website: www.ktranswa.com.au; email: admin@ktranswa.com.au; phone: (08) 9353 2666. There will be a major fireworks display just before the final race of the Championship on Sunday, 31 March. Saturday Night (30 March): Adults $25, Age and Student Concession $20, Children aged 12-15 $5, Under 12 FREE, Family Tickets (2 adults and 4 children) $55, Car Parking free, souvenir programme $5. Sunday Night (31 March): Adults $30, Age and Student Concession $25, Children aged 12-15 $10, Under 12 FREE, Family Tickets (2 adults and 4 children) $70, Car Parking free, souvenir programme $5. There will be separate programmes for each night. The programme for the qualifying meeting will include colour photographs of the 16 teams. The programme for the Championship Final meeting will include colour photographs of the eight seeded teams, and a detailed history of the Championship. The track will be available for practice on Thursday night, 28 March, from 6pm. Free entry for spectators. Cold drinks on sale but no food. Food and drink: Full bar and catering available. Food includes hot chips, pies, pasties, sausage rolls, Chico Rolls, dim sims, hot dogs, sandwiches, doughnuts, coffee, cold drinks, sweets. Please note a condition of our liquor licence is no byo alcohol or glass can be brought into the venue. Also note no pets, other than guide dogs, are allowed into the venue. Seating: There are large grassed viewing mounds and terracing but no grandstand seating, so bring deck chairs or blankets if you do not want to sit on the grass. Weather Forecast: As at 26 March – Maximum 25, minimum 15, possible morning shower which will help make the track perfect! The best way to get to Gillman Speedway is off Hanson Road. If you are coming from the eastern and southern suburbs, get on to Hanson road off Torrens Road or Grand Junction Road, travel north on Hanson road over the train line then take the first road on the left, which is Wilkins road. For interstate visitors flying into Adelaide and getting a hire car, Gillman is about 30 minutes’ drive from the airport. The easiest and most direct way, if not going to your accommodation first is: On leaving the airport, turn left onto Sir Donald Bradman Drive. Continue along Sir Donald Bradman Drive until you reach the end of the airports grounds and turn right onto Tapleys Hill Road. Just keep going on Tapleys Hill Road until you can’t go any further. That’s Port Road. Turn left onto Port Road. You can only turn left, you can’t go straight ahead or turn right, so pretty easy to this point. Continue down Port Road for about 1 km to the first intersection which is Grand Junction road and turn right. You only go 700 metres along Grand Junction Road over a bridge over a railway line. Stay in the left lane because at the bottom of the bridge you turn left into Gray Terrace. Go to the end of Gray Terrace and turn right (you can’t go straight ahead) onto Bedford Street. Just keep going on that Road until you get to the speedway. About 2 kms. The whole trip is about 20kms, and half-an-hour depending on traffic lights. Once you are on Tapleys Hill Road you can’t really go wrong. You only have to make three or four turns and most of those are simple. There is plenty of accommodation in Adelaide and suburbs, within 20-30 minutes of the Speedway, ranging from five star hotels to caravan parks and backpacker hostels. The Pavlos Motel on Main North Road, Pooraka offers a discount to speedway fans but you must ring the motel direct and ask for the Gillman Speedway discount. Full details are on the Gillman website under the accommodation tab. Mark Plaisted and Sam Gilbert won Round 5 of the Ikon Suspension Sidecar Grand Slam after a drawn out final which was rerun twice at Gillman Speedway last night (16 March). Darrin Treloar/Simon Cohrs finished second and Warren Monson/Matt Morgan with Mick Headland/Paul Waters excluded. Only six points now separate the top three teams going into the last round at Kurri Kurri on 6 April. Monson/Morgan lead with 76, followed by Treloar/Cohrs on 72 and Mark Plaisted/Gilbert on 70. Full heat results are on the Gillman Speedway website under Results Tab. Exciting heat race action from the camera of Judy Mackay. Mark Plaisted/Sam Gilbert (yellow) giving it everything to chase down Mick Headland-Paul Waters in heat 17. Headland went on to win while Plaisted finished third behind Trent Headland-Jesse Headland (blue), riding Mick’s #2 bike. It was Plaisted’s only loss on the night. Adelaide girl sets her sights on the Galaxy! Adelaide model Colleen Boyle, who added a bit of glamour to Gillman Speedway with her fund-raising appearances earlier in the season, will be back at Gillman this Saturday night. Since she was last here she has gone onto bigger and better things in her modelling career and is one of South Australia’s four representatives in the Miss Galaxy Australia contest in Sydney later this month. So what’s Colleen’s tie-in with Speedway? Well, she is the daughter of former Solo rider Danny Boyle. “Yes, my father was a rider at Rowley Park, as were some of my uncles, Tony, Martin and Kieran” Colleen explained. “But even before that my grandparents (Mick and Mary) use to go to the speedway as far back as the 1940s, so I’ve always been aware of the speedway and what a family orientated sport it is. I know friends of my Dad have been going for 50 or 60 years and still love the racing, and at the other end of the family tree they now take their grandchildren, some as young as 3 or 4, and they love the colour and the atmosphere, and being able to go into the pits and maybe sit of their hero’s bike. The prestigious Miss Galaxy Beauty Pageant is one which focuses not only on outer beauty; the contestants are encouraged to fundraise for Make-A-Wish Foundation. “Raising Money for the children’s charity has become much more important to me then winning the pageant” says Colleen. 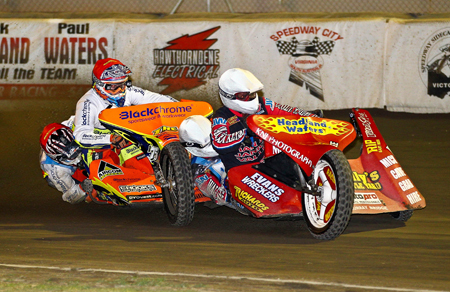 Speedway fans can warm up — if that’s the right phrase to use during the heat wave we have been having — for this Saturday night’s Ikon Suspension Sidecar Grand Slam meeting at Gillman Speedway, by watching the previous round, also staged at the Gillman Speedway Stadium in Adelaide, on the Speed Channel (Foxtel & Austar) tonight (13 March) at 8.30pm EDT. The one hour highlights show, will be screened on the top rating Chequered Flag program, Australia’s only weekly speedway television show. The 60 minute program will feature extended coverage of the best races held on the night, plus a highlights package providing an overview of all races conducted. In addition there will be interviews with many of the top riders and passengers from the Grand Slam tournament, and a feature story on the history of Gillman Speedway Stadium. 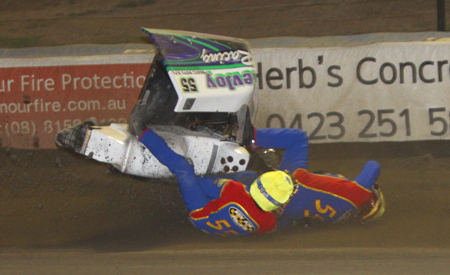 The Ikon Suspension Sidecar Grand Slam Series returns to Adelaide this Saturday night (16 March), the first of three massive Sidecar nights in the last fortnight of March at the Gillman Speedway Stadium, with the K Trans Australian Championship meetings following on 30 & 31 March. 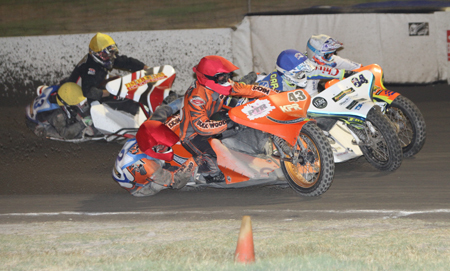 The Grand Slam event is likely to be the most keenly contested round so far as not only will the riders be striving to put themselves in a strong position in the overall standings prior to the deciding round at Kurri Kurri on 6 April, but this will also be last chance for any of the riders to get track time before the K Trans Australian Championship. As such the Grand Slam round has attracted a field equal to that selected for the Australian Championship. Headlining the line-up are the reigning Australian Champions Darrin Treloar and Simon Cohrs, and twice World Track Racing Champion Mick Headland and passenger Paul Waters, former FIM Gold Trophy Champion and Australian Champion Scott Christopher and his talented passenger, second generation star, Tyler Moon, and former Australian Champions Mark Mitchell and Tom Golding. But none of these riders lead the series point score. After four of the six rounds that honour goes to current Victorian Champions Warren Monson and Matt Morgan. They have 60 points; 6 points clear of Treloar and Cohrs, who in turn are 4 points in advance of current South Australian Champions Mark Plaisted and Sam Gilbert. The other riders in the line-up are Byren Gates/Michael O’Loughlin, who won the first round of the series, Queensland’s Wes Jenkins (passenger Damian Egan) who has emerged as a dark-horse for the Australian Championship after recent impressive performances at Gillman, local stars Trent Headland/Jesse Headland, Jason Hardy/Geoff Langdon and Damien Niesche/Mitchell Spear, all three of whom have stepped up to challenge the star riders this season, and New Zealand pairs Andrew Buchanan/Philippa Burns and John Hannan/Bryce Rose. Hannan and Rose, twice NZ Champions, have found the Aussies to be tough opposition on their home tracks, but Buchanan and Burns have regularly been a match for the best of the Aussies prior to Burns breaking her foot in an event at Palmerston North (NZ) in January. Meeting Date: Saturday night, 16 March 2013. Tim Bichard / Dale Knights (SA), Rick Curran / Brian Anthony (Vic), Aaron Hartwig / Teagan Hartwig (SA) and Aaron Silvy / Matthew Barkla will contest a qualifying race to determine the final three riders and the reserve. Ikon Suspension is a division of Proven Products Pty Ltd, which specialises in the manufacture of motorcycle shock absorbers and springs. While the name Ikon only hit the road in 2001, Proven Products has specialised in suspension since 1962. Proven Products has had a strong involvement with speedway motorcycle racing in Australia previously having supported events such as the Australian Solo Championship, the Leigh Adams Testimonial and the International Speedway Masters Series that was successfully conducted across Australia for many years. This is their second year as the major sponsor of the Sidecar Grand Slam. Warren Monson/Matt Morgan 60, Darrin Treloar/Simon Cohrs 54, Mark Plaisted/Sam Gilbert 50, Byren Gates/Michael O’Loughlin 48 and Mick Headland/Paul Waters 45. A full list of scorers from every round is in Saturday night’s programme. Three junior Sidecar teams, Tom Adams/Katelyn Silvy (SA), Jack Sylvia/Harry Hearne (Vic) and Jackson Barbary/Josh Malic (Vic) will get as many runs as they can handle during the track watering breaks in preparation for the big junior Sidecar meetings (Aircom Systems Junior Spectacular and the Territory Marine sponsored O’Brien Cup) coming up on 30 & 31 March. Food and drink: Full bar and catering available. Food includes hot chips, pies, pasties, sausage rolls, Chico Rolls, dim sims, hot dogs, sandwiches, doughnuts, sweets, cold drinks, coffee. Please note a condition of our liquor licence is no byo alcohol or glass can be brought into the venue. Also note no pets, other than guide dogs, are allowed into the venue. Weather Forecast: Maximum 26 degrees, minimum 16 degrees. Action in the final, series leaders Warren Monson/Matt Morgan (red), Darrin Treloar/Simon Cohrs (blue), Mark Plaisted/Sam Gilbert (white) and Wes Jenkins/Damian Egan (yellow). Photo by www.jdmphotos.net Emerging stars Trent Headland/Jesse Headland (blue) and Jason Hardy/Geoff Langdon have taken on and beaten the best riders at times this season. Photo by Judy Mackay. Close and exciting racing – and these are only riders from the Qualifying race. Tim Bichard/Dale Knights lead Aaron Hartwig/Teagan Hartwig. Photo by Judy Mackay. 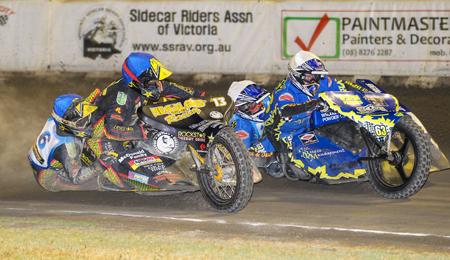 South Australian riders finished first and third in the prestigious Mildura Sidecar Spectacular on Saturday night. The event, the longest running, non-Championship event in Speedway Sidecar racing, was won by Mick Headland and Paul Waters, who were unbeaten on the night. Finishing in third place, in one of their best results were Damian Niesche and Mitch Spear. They finished as the second highest scorers in the same group as Headland, then second again to Headland, but ahead of Byren Gates/Mick O’Loughlin and Clint Mayes/Andrew Summerhayes in their semi-final before finishing third behind Headland/Waters and Darrin Treloar/Simon Cohrs in the final. Victorian Champions Warren Monson and Matt Morgan finished fourth. Bad news for fans of the Prince of Port Adelaide, Ron Parker. The popular Adelaide rider, who finished fourth in the Championship in 2007, and fifth in 2008, has withdrawn from this season’s Championship. Parker crashed at the last Gillman meeting and the bike nosed-dived onto his leg. Although, fortunately, nothing is broken he says he doesn’t want to leave it until the last minute to see if he is fit enough to ride and possibly deprive someone else of a chance so he has made the early call. 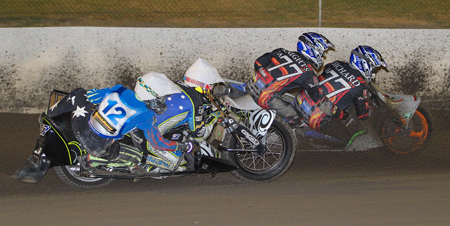 New South Wales rider Shane Hudson will take his place in the Qualifying meeting on 30 March. Meanwhile, Parker will maintain an interest by putting Division 2 rider Aaron Silvy on his bike for this Saturday night’s Gillman meeting. Full details of the meeting, Round 5 of the Ikon Suspension Sidecar Grand Slam, will be on the Gillman Speedway website later today (11 March). The progressive Gillman Speedway Stadium requires a Canteen Manager for the 2013/14 season. Interested people should contact the Speedway Riders Association of SA President Ivan Golding on 0417 138378 or ivangold@sa.chariot.net.au or in person at the track. During the winter of 2011 the main canteen was enlarged and re-fitted to allow for a greater variety of food, and now sells hot chips, pies, pasties, sausage rolls, Chico Rolls, dim sims, hot dogs, sandwiches, doughnuts, cold drinks, coffee and sweets.